The Union ministry of environment and forests (moef) has reached the first milestone of its ministerial exercise 'Defining Forest in Indian Context'. At a two-day meeting held on April 30-May 1, 2007, the Ashoka Trust for Research in Ecology and the Environment (atree), a consultant to the ministry for this project, proposed a definition of a forest that already promises to add new potholes in the already-bumpy road of forest management. This is the definition "An area under Government control notified or recorded as 'forest' under any Act, for conservation and management of ecological and biological resources." The mission 'what-is-a-forest' started last year. The ministry called for institutions willing to take up the assignation. Five were short-listed by July 2006, and between September 4, 2006 and August 2, 2006 presented detailed technical and financial proposals. On the basis of the former, three institutions were further short-listed. atree, a Bangalore-based research organisation, clinched the consultancy because their financial bid was the lowest, says one sour competitor. In February, atree put out advertisements in the media asking for public inputs to the project. They said they needed all inputs by April 15, 2007. The speed is telling. By April end, a workshop was organised in Delhi, to discuss a draft definition. To evolve the definition(s) of forest in Indian context keeping international commitments and different orders of the apex court of the country into consideration. To develop ecologically sound and socially desirable definitions of forests. These 'international commitments' are left completely undefined. Consultants are merely required to keep within their scope, "Forest-related definitions accepted in various international conventions such as cbd, unccd, unfccc and unff etc". In all these conventions, the definitions follow the technicist tenets of 'scientific forestry'. Moreover, when the terms of reference state the need to make allowance for the "different orders of the apex court of the country", the reference is to T N Godavarman Thirumalpad v Union of India, an ongoing case under whose umbrella all forest cases are today sheltered. For, in a December 12, 1996 order, the Supreme Court (sc) provided the definition of 'forest' by bringing all areas into the 'dictionary meaning' of forests. This rewrote the law, by bringing into the ambit areas of forests not under the forest department, but under tree cover. The direction of the exercise becomes clearer in rather obtusely written comments Prodipto Ghosh, secretary, moef, sent atree on April 24, 2007, just six days before the meeting. The comments circumscribe the horizon which the definition must take. The definition must always be evaluable in "policy terms". "It is impermissible," atree is directed, "to impair the pre-existing rights and entitlements of people, including society generally, over the land in question", unless "ecological values of land dominate all other possible uses and claims, including livelihood...in every situation," a parameter of definition "which itself must flow from prior policy (and constitutional) determination". The text is a masterpiece of qualification. But clearly, the aim is to find a way to blur local people's local rights needs and rights over their forest resources by the innocent phrase "including society generally". Ghosh also says that the definition must not "encroach" into the domain of other legislations and "their concerned Regulatory Authorities" through widening the notion of "forest" well beyond what an intuitive, common-sense interpretation would support. He goes on to cite, "The Environment Protection Act, the Air and Water Acts, and various other acts relating to soil, water, marine wildlife, etc". In other words, the terms laid out to the consultants are clear focus on the common-sense interpretation and do not tread on other regulations and other interest groups. The third point laid out by the secretary, moef, is more revealing "Legal definition of forest must not provide perverse incentives not to undertake afforestation". This is a reference to the Indian Forest Act, 1927 and the Forest (Conservation) Act, 1980 (fca), which create conditions for afforestation on forestland and also restrictions on cutting trees and their transport. The point is revealing because it comes in the wake of the moef's proposal to grant large areas of forestland to industry for afforestation. Under existing laws, planting trees on "forest land" by industry is not permitted. The ministry, under persuasion by industry has formulated the multi-stakeholder partnership for forestation, which aims to plant trees (see 'Private Affairs,' Down To Earth April 15, 2006). A 'suitable' re-definition would help proposal proponents move ahead. What is clear is that the 'definition' exercise is not a simple bureaucratic projection. There is a forest behind the trees that needs to be discovered. At the April-end workshop, the consultants put forward a draft definition henceforth, forests in India would be defined as "an area under Government control notified or recorded as 'forest' under any Act, for the conservation and management of ecological and biological resources". An explanation is attached such forests will include areas with trees, scrubland, grasslands, wetlands, waterbodies, deserts, glaciers, geomorphic features or any other area that is necessary to maintain ecological security. Whose forest is a forest? Firstly, it is clear the consultants have decided to revert to the past. They define a forest as the area under government control and one notified or recorded as forest under any act. This would work to overturn the sc's definition of forests as "the word forests must be understood according to its dictionary meaning.This description covers all statutorily recognized forests, whether designated as reserve, protected or otherwise...The term will not only include forest as understood in the dictionary sense, but also any area recorded as forest in government record irrespective of the ownership." This dictionary meaning would apply to all projects--dams, mining, industry and others--which need clearance under the fca. Under the suggested definition, forests would only be forests if they were under government control. They also qualify that this recording as forest must be for ecological purposes. This could mean that 'forest', even if notified and under government control, would be a 'forest' only if reserved for serving conservation objectives. In this definition, there is no space for the livelihood and ecological needs of local communities, who live on these lands, but whose rights are often not recorded or asserted. Definition or not, the status of land rights in forests is an unholy mess. There are large areas recorded as 'unclassed' forest in government records; here the ownership, land-use and settlement of rights is unclear. Most affected are tribal communities, whose lands were appropriated by the colonial rulers, but their rights not determined. They continue to live as trespassers on their own land. Forest areas recorded in government records as belonging to the forest department are classified as 'Reserved' or 'Protected' categories. But such classification glosses over the reality that, over time, state forest departments have claimed land without following protocol as laid down by the law, or have not settled the claims of people living in such lands. For example, revenue land settlements carried out during 1960-1970 in Orissa, for example, declared the hilly tracts--predominantly inhabited by the state's seven million tribals--as state property without proper survey. In Andhra Pradesh (ap), almost all the tribal area under Schedule v of the constitution has been notified as forest. This represents 65 per cent of the state's forest area. 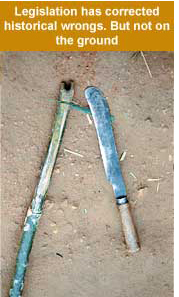 Fallow shifting cultivation lands were declared reserve forests and the rights of tribal cultivators over the limited cultivable land left with them were not recognised. Official records note that 31,428 ha in ap's 'reserve forests' were under cultivation by tribals prior to enactment of the Forest (Conservation) Act, 1980, or fca (See 'Bad in Law' Down To Earth, July 15, 2003). Often, there is confusion related to jurisdiction over land, the preserve either of the forest department or the revenue land.As Sanjay Patnaik of Bhubaneshwar-based Regional Centre for Development Cooperation, an ngo, explains in the case of Orissa, "The revenue department controls more than 50 per cent of the state's recorded forest cover. Much of this is recorded as 'demarcated protected forest'." Or consider the problem of 'orange areas' in Madhya Pradesh--land the forest department has transferred to the revenue department. According to Anil Garg of Ekta Parishad, a people's organisation, "About 1,900,000 ha was given to the revenue department without denotification and another 1,900,000 ha was denotified and given to them. In either case, the forest department did not update the records." Garg adds an interesting rider under the draft definition, these areas would classify as 'forest', because they are recorded so, even though little forest exists on them. Garg says that by bringing in the definition, the government merely wants to suppress its mistakes, instead of rectifying them. The suggested definition adds to the confusion will these 'unclassed' forests be covered under the definition as they are under government control? Or would these be left out because these lands are not protected for conservation purposes? Then there is the matter of private lands which is forests under dictionary meaning. These lands are not under government control. The suggested definition has no space for them. Says Sanjay Upadhyay, a Supreme Court advocate, and managing partner, Enviro Legal Defence Firm (which had also submitted a technical bid for the project) "At first glance, the operative words seem to be "area under government control" and the qualifier is "for the conservation and management of ecological and biological resources". This implies that laws such as the Indian Forest Act, 1927 and the fca would only apply to areas that have been notified so." This may jeopardise the future of many tracts of land in Northeast India and the Schedule v areas with if this indeed becomes the operative definition. According to the State of Forest Report 2003 of the Forest Survey of India, a government agency, some 16,479 sq km of forests in Arunachal Pradesh, 7,343 sq km in Meghalaya and 4,980 sq km and 1,713 sq km in Nagaland and Mizoram respectively are outside the control of the forest department. According to a study by Community Forestry International, a forestry research organisation, a large percentage of what it calls the 'total forest area' in these states are community-controlled (see table On the chopping block?). In other words, the suggested definition would restore these lands back to the communities. But in other regions, the matters are quite different. Here the implications of the definition would be also quite different. Take, for instance, central India's forest states, Chhattisgarh, Jharkhand or Orissa. As Patnaik explains "About 20 per cent of Orissa's forest is outside of the forest department's control. Worse, much of this area is in the remote parts of the state. With the draft definition, it would be simple to buy land and become a landlord." This is the nub if the draft definition comes into force, such areas could easily be diverted for non-forest uses. Explains Upadhyay "The fca is a check on conversion of land that is used as a forest to non-forest use. Not just ecology, the purpose of the entire act may get defeated for these areas if the draft definition is accepted." Coincidentally, there is a huge backlog of forest clearance cases (by law, states require clearance from the centre, that is the ministry, to divert forestland for projects). According to the ministry's website, 278 cases are pending for forest clearances with the centre and another 1,108 with the state governments. Hydroelectric projects need some 190 ha of forest area, a majority in Sikkim. Major irrigation projects of the government, mainly in Andhra Pradesh, Madhya Pradesh, Maharashtra and Chhattisgarh require 5,541 ha of forest land to be diverted. 618,718 ha of forest clearance is needed for 38 mining projects, mostly in Chhattisgarh, Madhya Pradesh and Orissa. Rehabilitation projects need 1,562 ha of land, the major demand being that of Rajasthan. 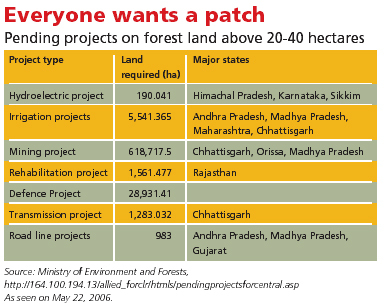 Defence projects want 28,931 ha of forest clearances. Power transmission projects need about 1,283 ha, mostly in Chhattisgarh and road line projects require 983 ha in ap, Madhya Pradesh and Gujarat. Could the draft definition put clearances on the fast track? Many of the cases for clearances have been pending because of a row between the sc and the moef over the constitution of the Forest Advisory Committee (fac). It was decided that moef must appoint "three non-official" members of the fac in consultation with the sc, the Central Empowered Committee and the amicus curiae. But in 2005, when the fac was formed neither was consulted. The sc did not take to this kindly. Also, the fac was formed in accordance with Forest Conservation (Amendment) Rules, 2004, which had been stayed by the sc. From September 15, 2006 till April 27 this year there was no fac and so no forest clearances. On April 27, the sc allowed the moef-appointed fac to clear cases, but with a rider. The cases cleared by the fac will have to be approved by the apex court and its Central Empowered Committee (See 'Forest Row', Down To Earth, May 31, 2007). This row isn't over yet. "The crucial watershed in the history of Indian forestry," writes historian Ramachandra Guha in his essay The Prehistory of Community Forestry (Environmental History, April 2001) "is undoubtedly the building of the railway network", 1853 onwards. An annual demand of over a million railway sleepers translated into an unregulated assault on forests; among others, the sal forests of Garhwal and Kumaon were devastated. Realising forests weren't inexhaustible, the British had to opt for sustained-yield forestry and so formed the Imperial Forest Department in 1864. But this newly-formed proprietor had an immediate problem it had no rights over India's forests. The Indian Forest Act, 1865 defines 'forest' as "land covered with trees, brushwood and jungle". Its main purpose was to facilitate extraction for railway work. The act was inadequate so far as state control was concerned.Its definition of 'forest' inhibited government from raising plantations on barren land. Then in 1869, the government circulated a draft legislation to the provinces. It assumed ownership, and use, of forests vested in the State; therefore the customary rights people had hitherto enjoyed were to be limited, or extinguished. Despite objections from the Madras Presidency the bill was passed. The Forest Act 1878 did not define 'forest'. It classified them into three types on the basis of function. 'Reserve forests' were for commercial exploitation; its establishment was preceded by a legal settlement that extinguished people's customary rights, or transferred them as "privileges" to be exercised elsewhere. Limited use was allowed only in exceptional cases. Then there were 'protected forests', where rights were recorded but not settled. In such forests, the forest department could prohibit grazing, or any use it perceived as harmful to the forest; such forests could also be converted to 'reserve forests' when required. Thirdly, there were 'village forests', about which comments Guha "But as these lands had first to be constituted as reserved forests, the procedure aroused suspicion among the villagers, and this chapter remained a 'dead letter'." The State began to establish firm control; increasing demand for wood products were met by expanding the area under the act and converting protected forests to reserve forests by the turn of the century, according to Colonial Forest Policy in India Tenurial Issues in Indian Forestry by N C Saxena, "some 20 million hectares (m ha) of land was brought under Reserve Forests". In the interim, the government clarified the scope of its control. In the Indian Forest Policy, 1894, 'Forest' was not defined, but functionally classified. There were a) First Class forests forests for preservation, especially on hill-slopes; b) Second Class forests for supply of timber and to meet commercial needs; such forestland could also be diverted for agricultural use; c) Third Class forests minor forests, with inferior timber and lesser growth; these could be used for the fuelwood and fodder needs of local populations; and d) Fourth Class forests pasture lands, which were forests only in name. The bulk of ownership remained with government; communities had limited rights, in the form of servitude, not as full owner. The 1878 Act along with the 1894 policy enabled large-scale conversion of forestland to agriculture--to generate revenue--between 1875 and 1925; a fallout was a huge decimation of wildlife 80,000 tigers, 150,000 leopards and 200,000 wolves were killed for bounty in this period, according to a draft discussion paper of atree.Rights over forests in the hilly states were severely curtailed, and protests broke out peasant movements have been recorded in the Kumaon hills in 1904, 1906, 1916, 1921, 1930 and 1942. The most significant one was in 1921. It included labour strikes, and state-owned pine plantations were torched. Some 395 incidents of fire were reported on 99,555 ha of forests. The government had to concede proper rights to village communities. 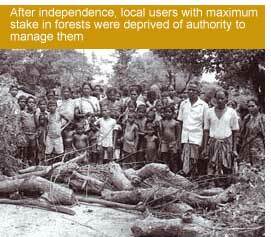 Indeed the act provoked major rebellions against colonial forestry. Guha lists "In Chotanagpur in 1893, in Bastar in 1910, in Gudem-Rampa in 1879-80 and again in 1922-23, in Midnapur in 1920, and in Adilabad in 1940. These rebellions sometimes extended over several hundred square miles of territory, involved thousands of villagers, and had to be put down by armed force. Even where discontent did not manifest itself in open rebellion, it was expressed through arson, noncompliance, and breaches of the forest law". An effect of the rebellions was that when the colonial government framed the Forest Act, 1927--still in use--it introduced a process of settling the customary rights of users under various sections. It did not define 'forests', but laid down detailed procedures to notify three types of forests a) Reserve Forest, over which people had no rights; b) Protected Forest, where rights were recorded, which the government had full powers to revoke; and c) Village Forest, whose conservation was desirable, whether burdened or free of rights of the user. The British left behind a department that was the country's biggest landlord according to Saxena, the areas under Reserve and Protected Forests were 31 m ha and 15 m ha respectively. 1947-1971 has been called the 'extractive phase' of Indian forestry. Its direction came from the first policy statement of the Indian government the National Forest Policy, 1952. The policy did not define 'forest', but classified them functionally into four categories a) Protection forests; b) National forests; c) Village forests; and d) Private forests and tree lands. The functions of protection and village forests remained unchanged. National forests were to meet defence, communications and industry needs with increasing yield. The State maintained its control over forests. Private forest owners had full rights, but communities had only limited rights in the form of servitude and only in certain classes of forests. Sustained supply of timber and forest produce for industry was a main plank of the policy. Forestry was predicated upon national interests. Madhu Sarin has shown what this emphasis led to in the states. Blanket notifications by state governments declared all kinds of lands--nistari and gramya jungles (village forests), village grazing lands, natural grasslands, alpine pastures, village ponds and wetlands, areas inhabited by 'primitive tribal groups' and lands under shifting and/or settled cultivation by tribal communities--as state 'forests'. "Such takeover resulted in two critical changes. One, local users with maximum stake in forests were deprived of authority to manage them; and two, management objectives changed from fulfilling local needs to revenue generation for the state". Further, a vital safety clause-- state intention to reserve an area as forest also requires appointment of a forest settlement officer to settle claims of pre-existing occupants and users--was often dispensed with. Forest management turned into a mess the forest department is yet to resolve "Many forestlands are yet to be surveyed and land rights of pre-existing occupants not settled. In many cases, the areas are yet to be finally notified as forests under the Indian Forest Act, 1927. Therefore, even their legal status as state 'forests' is open to challenge." This period is 'protectionist' in nature, initially to save India's forests for her tigers, and then to check rampant, often arbitrary de-reservation of forests. But it also was a period when people living inside and around forests were placed in a regulatory vice that literally squeezed their entrails. The Wildlife (Protection) Act, 1972 introduced a new dimension to managing forests conserving wildlife. It also inaugurated a new dimension to forest ownership. True, the act saved many ecologically critical areas and threatened wildlife species from being wiped out by dams, mines, cities, and expanding agricultural land. But a new arena of conflict emerged between people and State fiat on forestland. Consider the 1972 Act. Till it was amended in 1991, under the act, a sanctuary could be notified without the rights of people living in those lands being determined. Therefore, in notified sanctuaries in the period 1972-1991, rights weren't determined. Moreover, even as the act was implemented, what got overlooked was an original statutory defect a sanctuary could be notified immediately, even if the rights of people weren't settled. Thus, until this defect was mitigated--only in law--by another amendment in 2003, there was no settlement of rights of people in and around forests. The situation was similar around national parks. Millions living within burgeoning protected areas became outsiders in their own land, and conflicts intensified. Till date, only five of the 32 sanctuaries and 12 national parks--with tribal populations of 22,497 and 1,77,895 respectively--have been legally notified for the settlement of rights. In 1976, the prestigious National Commission on Agriculture--nca, an agency attached to the Union ministry of agriculture, then in charge of forests; the moef was formed only in 1985--said that the tribals' "rights and privileges have brought destruction to the forests and so it is necessary to reverse the process". Asserted the nca report "production of industrial wood has to be the raison d' etre for the existence of forests". Its commercial bias was evident "The rural people have not contributed much towards the maintenance or regeneration of the forests. Having over-exploited the resources they cannot in all fairness expect that somebody else will take the trouble of providing them with forest produce free of charge". The report recommended that all forestlands be classified into protection forests, production forests and social forests, with highest priority to production forests. It tried to reset the objective of forest management to pushing yields to many times more than what was being obtained. In the same year, protectionism was legitimised by transferring--during the Emergency--'forests' from the state list to the concurrent list. Four years later, an ordinance rushed through Parliament and became the Forest (Conservation) Act, 1980 (fca) on October 25 that year. Reminisces Samar Singh, at that time joint secretary in the Union ministry of agriculture "When Indira Gandhi was elected back to power (1980), one of her major concerns was that a lot of forests were being decimated. She spoke to the minister for agriculture, and then we at the ministry were directed to come up with a draft legislation to check this. Gandhi saw the problem at state level. She thought that the states were diverting a lot of forestland for non-forest purposes." fca did not define 'forests'. It stipulated states could not de-reserve forests or put forest land to non-forest use without permission from the centre. 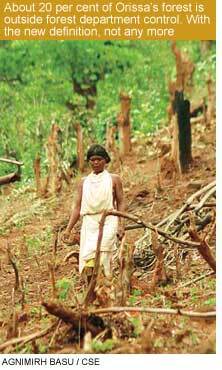 It had stringent provisions disallowing settlement rights on forestland.The government set October 25, 1980 as the cut-off date for recognising the rights of tribals and other forest dwellers. In effect, millions of tribals became encroachers, liable for eviction. As the National Commission on Scheduled Castes and Scheduled Tribes has noted, in Madhya Pradesh itself, 1.48 lakh people, mainly tribals, occupying 1.81 lakh ha of land in forest areas became encroachers October 25 onwards. fca put an end to jhum, or shifting cultivation, on government forest, making it impossible for communities practising jhum to gain title rights over this land. Even the revenue villages that qualified for regularisation under the fca were not regularised. The state governments and the centre sat over the regularisation processes; it became a vote bank issue. This period may be called the 'degenerate' phase of Indian forestry, riven as it is today with legislative and jurisdictional confusion between states and the centre, unresolved overlaps in statutory law, an institutional tussle at the centre over the terrain itself and the pressure, on the government, to feed the demands of fast-track growth. On paper, a slew of legislations--an amendment to the Wildlife (Protection ) Act, 1972; the Panchayat Extension to Scheduled Areas Act, 1997, and the The Scheduled Tribes and Other Traditional Forest Dwellers (Recognition of Forest Rights) Act, 2006--address the historical injustice meted out to tribals and forest dwellers. On the ground, conflicts and protests have intensified. The 1988 National Forest Policy was a direct result of the storm of protest that emerged in the wake of fca. It did not define 'forests'. But it did acknowledge the dissonance between statutory law and the rights of tribals and forest-dwellers for the first time, policy conceded that a symbiotic relationship existed between tribals and forests, and that people living in and around forests depended on it for their livelihood and survival. On the recommendation of the Commissioner for Scheduled Castes and Scheduled Tribes, the government converted the policy statement into a concrete recognition of rights with a set of circulars on September 18, 1990. But hardly any action was taken on them. Then in 1996, the law was re-written. Adjudicating on the T N Godavarman Thirumalpad vs Union of India case the Supreme Court passed a benchmark judgement where, for the first time in India's forest history, the word 'forest' was defined. The judgement was dramatic, but completely ignored the legislative framework related to forests, and the messy history of rights, claims and duties. According to an April 2005 report by Shomona Khanna and Naveen T K, a result of the judgement was that "large areas recorded as forest in the government records, whether under the revenue department, private or community ownership" came under the fca. 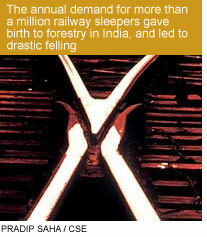 Worse, a number of interim orders the apex court passed turned forests into a huge battleground. In 1996, the apex court banned the felling of trees in forests. The ban was widely viewed as the only measure possible to prevent rapid felling of trees due to the government-timber lobby nexus especially in India's Northeast, which was losing 31,700 ha of forest every year, according to the moef. But it caused hardship to saw mill owners, those employed in timber-based activities and small private forest owners. 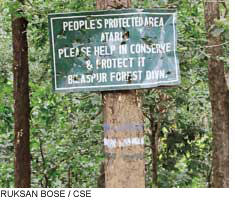 On May 3, 2003, the moef--narrowly interpreting a court order to settle rights inside forests--issued directions to all chief secretaries, forest secretaries and principal chief conservators of forests of all states and union territories, asking them to summarily evict all encroachers of forests "not eligible for regularisation". This led to massive eviction drives in Assam and Maharashtra. On February 19, 2003 police shot two people dead inside Kerala's Wayanad Wildlife Sanctuary while evicting tribal settlers who laid a siege on a part of the sanctuary for 45 days. Just a fortnight before, a tribal youth was killed in Chhattisgarh's Kawardha district while opposing eviction. In West Bengal, forest department keeps away the traditional fisherfolk from islands citing threat to mangrove forest. If there was a patch of forest, there was a conflict now. A case, which began as an effort to curtail logging in the forests of the Nilgiris, transformed into action against tribals. 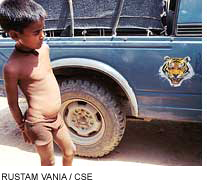 As Khanna and Naveen TK put it, "Today legal certainty haunts a variety of issues concerning the rights of tribals and forest dwellers over forests, such as the rights of patta holders in undemarcated protected forests in Madhya Pradesh and Chhattisgarh, right to regularisation of land titles, rights over non-timber forest produce, and nistar and other customary rights". Will the new definition lead to resolution? It is still a draft. Surely it can be re-oriented? There is no doubt that India needs a definition of 'forest'. The situation of parallel governance--ministry and court; forest laws and court orders--has ensured that the status quo in forest management is maintained, especially with respect to settling people's rights. The Indian Forest Act, 1927, while describing the process for notification, does not clarify why those notifications should be made. The qualification for the Indian Forest Act, 1927, is simply "An Act to consolidate the law relating to forests, the transit of forest-produce and the duty leviable on timber and other forest-produce." The problem arises when multiple uses of forests are divided into a rather simplistic two-fold classification Protected and Reserve; rights of usage are prohibited in one, permitted in the other.Worse, the Indian Forest Act 1927, and fca, 1980, do not specify areas that should to be notified, and those not, says Sharachchandra Lele, senior fellow and coordinator, Centre for Interdisciplinary Studies in Environment and Development, Bangalore. The draft definition leaves out local communities, with tremendous dependence on forests, stuck between the now-exploitation/now-conservation attitudes of the state that asserts strong control over forests. And in both attitudes, traditional users are a mismatch. As are many other, unstated values of a forest. Lele advocates for more categories of forest classification with varying degree of permitted activities. "If a particular forest is important for the biodiversity, its categorisation should concur. If local needs is the important function that another forest serves for the area, its management should enhance that purpose," he says. Watershed is an overarching function of these. Wildlife scientists have also argued for a similar cause. Y V Jhala, faculty of Dehradun-based Wildlife Institute of India, says that we must protect areas bearing in mind coverage of all the important types of ecosystems, a sustainable size being protected and that it should be connected to other similar areas for corridors of habitat for genes to flow freely. And protection could be with concentric circles of human use--with no human use allowed in some areas, certain other areas with less wildlife and more human use; and progressing to human dominated areas with no wildlife. "This zoning is needed with identification of land use types that are not at all compatible with biodiversity values beyond a point," he says. Reduction of forests to two functions--timber production and wilderness areas--also has other caveats. With reserve and protected forests, there is an entire parallel system of National Parks and Wildlife Sanctuaries that work under the Wildlife (Protection) Act, 1972. "The categories of forests became redundant as the purpose changed from timber extraction to coservation" says Lele. There is no guarantee in fca,1980, that the central government is not vulnerable to the industry lobby. The act also does not discount the fact that a state not lose out too much when it diverts forestland. The real loser at the end is the community that depends on the forest and that is something the law ignores almost totally. Lele talks of cases where, in compensation for diversion of forestland, the adjacent area was declared a wildlife sanctuary--hitting the local population twice as hard in the bargain. The local community may have wanted the land for a variety of possible uses agriculture, grazing, forest among them.And to retain the area as a forest is also some amount of loss, but they are made to give it up altogether for 'national interest'. The rights that these communities have in the area, to begin with, are never clearly demarcated and assigned, Lele rues. Local use is ignored, and never accounted for. According to Ashish Kothari, of Pune-based ngo Kalpvriksh, the different kinds of uses of forests already have their dedicated pieces of legislations the Biological Diversity Act, 2002, the Scheduled Tribes and Other Traditional Forest Dwellers (Recognition of Forest Right) Act, 2006, the Wildlife (Protection) Act, 1972, the Forest (Conservation) Act, 1980. The definition, Kothari believes, could have been used as an exercise to form guidelines for putting forests under either act. "An ecologist and sociologist would not disagree that a forest is land with predominant tree cover. It is the treatment that would be a matter of opinion. For that, a decision would have to be taken; which is where the definition could have helped," he says. But is the moef listening?